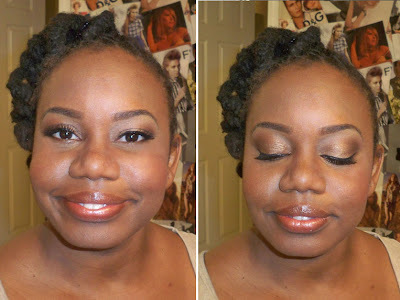 I'm back with another bronzy bride! This seems to be a popular color combination for many of my clients. I came up with a wedding look perfect for the summer. I recently had a client who definitely had a great occasion for getting her makeup done. She recently eloped in Vegas and was now back home to get her makeup done for a Wedding Celebration party for friends and family - what a great idea! The bride knew that she wanted airbrush foundation since she had a really great experience with it before. Additionally, she had a greek inspired white wedding/party dress and she wanted to go for a bronze look. In the past, she's been to makeup parties where she felt that artists had gone too dramatic with colors and the look...so she wanted to look like herself but still dressed up. I kept the makeup on the neutral side and made sure to not hide her beautiful features. Lashes work to always dress up the look without adding too much color. She looks lovely, I think you gave her exactly what she asked for! Reader Question - Bronzers for Women of Color? Winners! Week of B-day Giveaways!